Tearful Venezuelans had gone weeks without basic food items like milk, flour and toilet paper. It's a sad but common part of daily life today in crisis-ridden Venezuela, a country that has the world's largest proven reserves of oil. 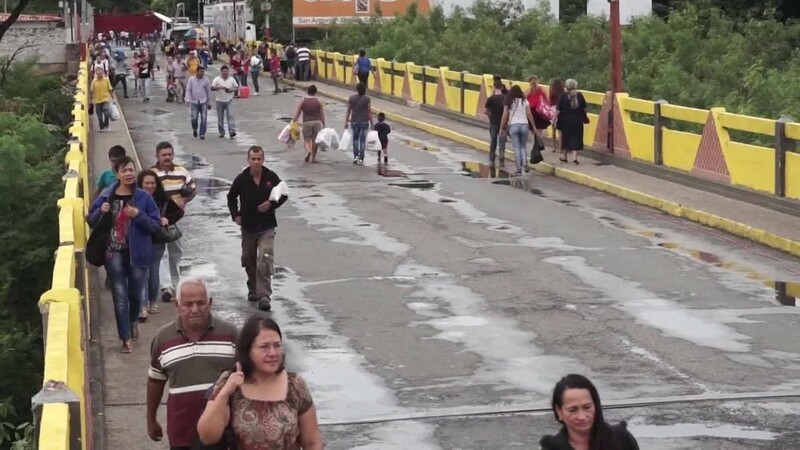 Colombian officials estimate that about 100,000 Venezuelans crossed the border. Venezuela is expected to dive deeper into the abyss this year, according to new projections published Wednesday by the International Monetary Fund. The IMF forecasts Venezuela's economy will shrink 10% this year, worse than its previous estimate of 8%. It also estimates that inflation in Venezuela will catapult to 700% this year, up from the earlier guess of about 480%. "Venezuela's economic condition continues to deteriorate," says Alejandro Werner, chief Latin America economist at the IMF. The estimates for growth and inflation are the worst worldwide. The numbers are just the tip of the iceberg. Venezuela is deep into a humanitarian crisis -- people are dying in ill-equipped hospitals and many live without basic food items. Venezuela can't pay to import goods because its government is desperately strapped for cash after years of mismanagement of its funds, heavy spending on poorly-run government programs, and lack of investment on its oil fields. Meanwhile, socialist President Nicolas Maduro is fighting against an opposition-led Congress that wants to impeach him. In January, Maduro packed the country's Supreme Court with allies to prevent opposition leaders from passing new legislation. Maduro also refuses to allow a referendum vote on his presidency. Most recently, Congress has attempted to strip some of the country's Supreme Court judges of their power and appoint new ones. It's all even more tragic given that despite Venezuela's oil abundance, its state-run oil company, PDVSA, is broke. Venezuela's oil production fell to a 13-year low in June, according to OPEC, of which it's a member. It's cash and gold stockpile are dwindling too. Veneuzuela's foreign reserves are now a mere $11.9 billion, according to its central bank. Two years ago it had $20 billion. The country has had to ship gold to Switzerland this year to help pay down its debts. Venezuela could be quickly approaching an economic judgment day. It owes about $5 billion in a string of bond payments between October and November. Many experts believe the chance of default is very high.